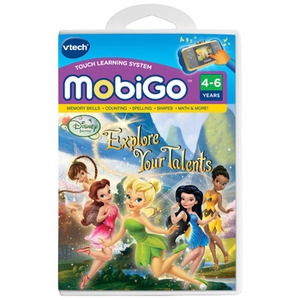 The Disney Fairies learning game cartridge for MobiGo includes six educational activities that let kids play as their favorite fairy. Your child will be engaged as they experience the beautiful animations music and Tinker Bell's real voice. Through interactive play with their favorite learning toy your child can build their core preschool skills with the touch of a finger. Features favorite Disney fairy friends Tinker Bell Silvermist Rosetta Iridessa and Fawn. And the voice of Tinker Bell! Play 6 learning games as different fairies that teach counting addition & subtraction letters spelling shapes creativity and more!